Have you wondered why boys like guns and girls like their dolls? Well the answer is quite simple, If you are a parent like us, you know that we buy guns for the boys and dolls for the girls. After sometime, they will just accept guns and if you buy them a doll, they will refuse playing with it or give it to the girls who visit them. Boys watch their dads and girls take cues from their mother. So the boys end up shaving, repairing toys and the girls end up doing makeup and cooking with their tiny kitchen sets. As for Vaitu, he is so far not into Guns (we haven’t brought him a gun to be precise) but he is a major car freak. 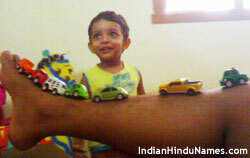 It is simple, I like cars and I end up buying him lot of miniature cars :). Apart from that, he has some kind of a liking for automobiles and can recognize most of them including a JCB. Now, that makes me a proud dad. Rishu on the other hand, can be spotted nowadays mostly with the broom or her moms makeup kit. Boys and Girls. Ok, here is what Vaitu came up with this weekend when I was lazily going through the news papers. The photo quality may not be good coz I grabbed my mobile phone and took the pictures without breaking the formation. Neat right?